1. You an access your Gmail account using Windows Live mail but because of security restrictions imposed by Google it isn’t as straightforward when accessing Yahoo mail. These two tutorials show you how to do both. or you are using a really insecure password like I mentioned in last months newsletter. According to various Internet security sources the most commonly used password on the Internet is 123456 closely followed by password. how to easily and quickly create strong but easy to remember passwords. 3. Have you ever needed to send an entire folder by email? If you have then you may have discovered that it isn’t as easy as it first seems. This tutorial will show you how. 4. Do you need to send large attachment by email? Email was designed as a file sharing system by it is often used that way because it is so easy to use. However all email systems impose limits on the size of an email. Currently it is around 25MB and it probably won’t change in the future. This limit is OK if you want the send a few files by email which is often the case. But if you want to send lots of photos by email then it becomes a problem. Fortunately there are easy ways around this by using a file sharing service like Dropbox, Onedrive or Google drive. If you use Yahoo Mail with a web browser then Yahoo mail integrates seamlessly with dropbox and if you use windows live mail it also integrates with Onedrive. 5. Do you need to copy text from a web page or word document into an email. If you try to copy text from a web page or a word document into an email using the simple Ctrl+C (copy) + Ctrl+V (paste) technique then you will also copy the text formatting which may mess things up. You can copy without formatting by using Ctrl+shift+V instead of the simple Ctrl+V. Alternatively copy into a notepad file which removes the foramtting and then copy from notepad into the email. 6. If you are using The outlook mail client thta comes with windows 10 then you might find these videos useful. Do you have a email related question? If you do the you can use the question form to ask and I will do my best to answer as soon as possible. At least once per month I try to publish new tips to help you with Email and the Internet in General. You can check back here to see the latest Tips or subscribe to the newsletter and get notified by email of anything new. 1.According to various Internet security sources the most commonly used password on the Internet is 123456 closely followed by password. If you are using insecure passwords then you should change them. This tutorial will show you how to easily and quickly create strong but easy to remember passwords. 2. Out of Office Replies/Replies? Holiday season is approaching and many people will be tempted to us out of office replies to inform friends that they aren’t available to respond to emails. 3. Have you Really Deleted that Email? – You’ve pressed the delete key, and the email disappears from your inbox, but it isn’t really deleted ? When you delete email most email clients will move the email into the deleted items folder and leave it there. Some clients (e.g Gmail web client) will automatically remove the email from the deleted items folder after a certain period (e.g 30 days). 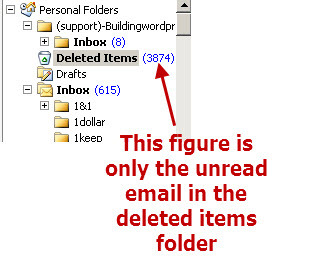 However most email clients require that you manually empty the deleted items folder. Email removed from the deleted items folder is permanently deleted. You should manually empty your deleted items folder on a regular basis as it can become very large as shown below. 1. Have you heard of Email recycling?– If you cancel an email address on an email provider e.g an ISP when moving providers then that old email address may be re -allocated to a new user on the old email provider at a later date. This can be a big security problem if you have used the old email address to access important sites like online banking. When moving away from an old email address make sure you change any web site login details that have used that old email address. 2. Have you forgotten you Email Password? – I’s very easy to do, You will be happy to learn that there are several easy methods available of finding forgotten passwords. See Finding and recovering a Lost password. If that fails you can reset it. See Resetting a Yahoo password for an example of this process. 3. Do you need to worry about using the correct case when entering an email address? Yes in theory but no in practice. The email address mailbox name (appears before the @) is case sensitive, but it is not enforced. The domain part of the email address (appears after the @) is not case sensitive. This means that so although the mailbox called Bsmith@mydomain.com should be different than the mailbox bsmith@mydomain.com in practice they are the same. To avoid confusion you should only use Lower case when creating a new email address. If you think someone you know would like this newsletter then why not forward it to them?